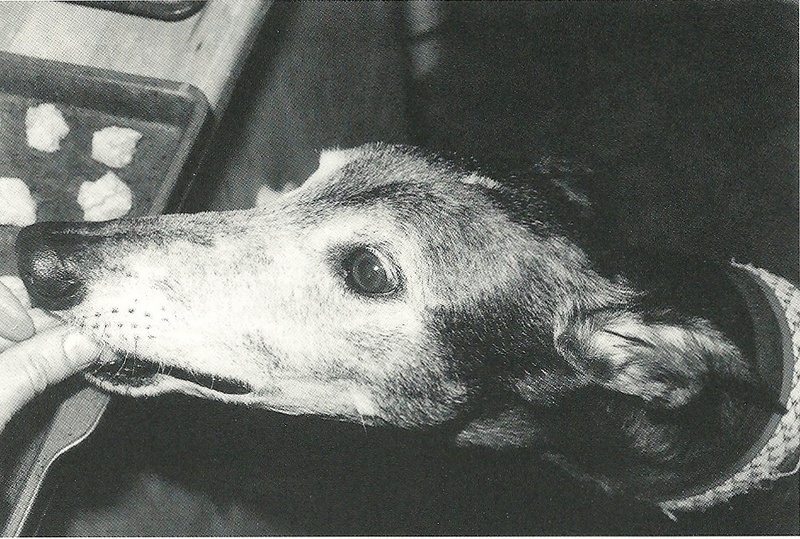 Greyhounds are considered an independent breed for good reason. For thousands of years they’ve been bred to work without human guidance while hunting game. But because of this independence Greyhounds tend to have opinions about what they want and don’t want to do and are regarded as a harder breed to train. Our job in training Greyhounds then is twofold. First we have to teach our Greyhounds how to do what we ask, and second we have to give them a good reason to do it! Let’s face it; most of our dogs are going to work best for treats. Now, some dogs are such chowhounds they’ll happily work for dry Cheerios™ or dog kibble. Of course, some dogs with more refined palates won’t. Rule number one regarding treats is the more interesting the location, the more interesting must be the treat. At home I can get away with cheese and dog biscuits (sometimes) but when we go to the obedience-training club, I better have something more enticing, like liver treats, chicken, or cheap steak. A really interesting location — like a dog show — requires top-of-the-line treats, and for them I make a run to the deli section to get some roast beef and sliced chicken or turkey. The trade-off with treats, though, is if they’re really good, they can also be tiny. My dog Marshall will work happily and hard for tiny bits of hot dog, but spit out bigger, uninteresting pieces of food at the club. Quality matters, not quantity. You want to use tiny pieces during training so you can reward frequently. With hot dogs I’ll cut a hot dog crosswise into penny-sized pieces. If we’re in a situation where I need to reward a lot (like learning something new or perfecting something boring), I’ll cut the pennies in fourths to make truly tiny pieces that can be used for frequent rewards. Some convenient treats I’ve used during the year include string cheese, Rollover or Oinker roll, skinless chicken or turkey pieces, dried liver treats, liver brownies, and honey-peanut butter training treats. In teaching retrieving, I had to pull out the big guns of peanut butter (smeared on the dumbbell), squeeze cheese (ditto), and canned chicken as a reward for picking up the nasty thing. Rule number two of dog treats is if your dog wants it, it can be considered a treat. For some reason Marshall loves French bread, so he sometimes works for baguette pieces. He also loves green apples, pecans, and figs. When any of these come into season we can train with windfalls. Just make sure that your treats don’t upset your dog’s digestion. You might also want to consider your digestion; if liver nauseates you, don’t use it! show your approval. While a Golden Retriever might work happily for a sullen “good dog” and a single pat on the head, most Greyhounds want a bit more than that. Let’s discuss body language first. Smile at your dog. Now really smile at your dog, letting your eyes twinkle and raising your eyebrows. Which does your dog respond to more strongly? You need to mean it when you praise your dog, because they read as much from facial language as they do from words. Speaking of words, here’s just a sampling of the kinds of things I’ll say during training: Yes! Fabulous! Yay! Great job! Wonderful! What a smart dog! Magnificent! Best yet! That was excellent! You got it! Looking good! That was perfect! Terrific! Good boy! Whatta job! Wonderful! Perfect! What a smart dog! Handsome boy! Excellent! All right! Some people like to use one word (often “excellent”) as a conditioned reinforcer. That means that have paired the word with treats (saying the word then immediately giving the dog a treat many, many times) until the dog understands the word means a treat is coming. At this point the dog will start reacting to the word in the same way he reacts to a treat (as long as the pairing between word and treat is maintained fairly frequently). Thus the word itself becomes a reward to the dog. You can read more about this idea in books on learning theory, like Pamela Reid’s Excel-Erated Learning. What does your dog love most in the whole world? Lure coursing? You may not be able to carry a lure-coursing field around in your pocket, but you can find ways to motivate your dog using his prey and play drives. Play with your dog! If he’ll play tug with you, great (as long as he’ll give up the toy when you ask). I had the opposite problem with Marshall when we started to add play into our training; he wouldn’t grab a toy if I held it. He knew too well I was alpha, and if I had the toy, well then it was my toy, not his! We fixed that problem by putting toys on the end of a string (or tied to the end of a six-foot leash when I needed to improvise). That put enough distance between the toy and me so he was willing to make a grab for it. If your dog has a favorite toy, use it to your advantage. Don’t let him play with it until he’s bored. Keep it in a special spot and let him play with it as a reward during training or when you’re spending special time together. Don’t let familiarity breed contempt. 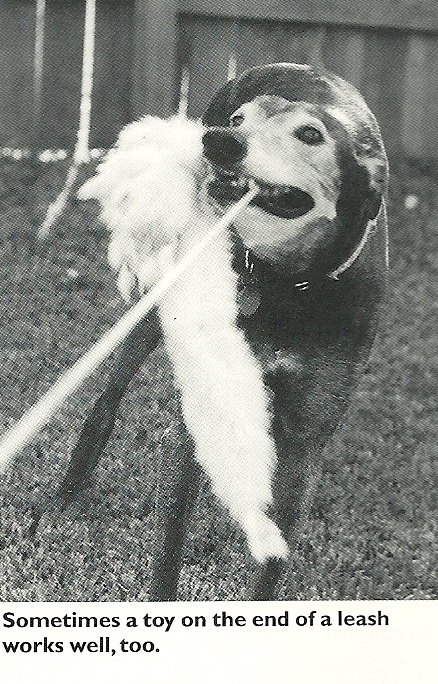 Squeaky toys are great for getting a Greyhound’s attention, but you don’t have to stop there. You can buy rabbit furs at craft stores. Look in the leather working section. Other toys that sometimes work well are balls (if your dog will chase it and bring it back), floppy Frisbees (which have the advantage that they can be hidden easily, then pulled out as a surprise reward), tug ropes, and even the leash itself. If your dog will play tug, you can use the leash as a tug toy so you always have a toy conveniently at hand. Watch how dogs play with each other and try to add some of that to your play sessions. When your dog does an especially good job, try dropping down on the ground to roll around with him. The first time you do this he’ll look at you like you’ve lost your mind (as will the neighbors, of course), but soon he’ll figure out this is an invitation to play! Some Greyhounds are such lap dogs that you can use lap time as a reward, too. After they’ve done something especially well, drop to the ground and let them crawl up on your lap for a few minutes of scritching and discussion of what smart dogs they are. Another physical reward is to let your dog give you a hug, with both front paws up on your shoulders. Marshall used to insist on this when he was learning the broad jump exercise (which he thought was pretty stupid). As a reward for doing a broad jump he insisted on being allowed to hug me. For a few weeks I had to change my shirt after our lunchtime training sessions! You also want to watch what your dog does when he’s happy for any reason. Many Greyhounds pogo when they’re excited, like when they’re getting ready to go for a walk or a car ride. I taught Marshall to jump up vertically on cue (starting with my hand held above my head with a treat, then just an arm swung upward, and finally evolving to simply clapping my hands together). He never considered pogoing (vertical jumping) in the context of doing obedience before I taught him this, but now he does it all the time. Somehow the joy he feels when he pogos of his own free will (like before a walk) has spilled over into his pogoing in the obedience ring. He’s happy and pleased with himself when he does it in the ring. If your dog has a trick he or she is especially fond of, use that as a break in training. 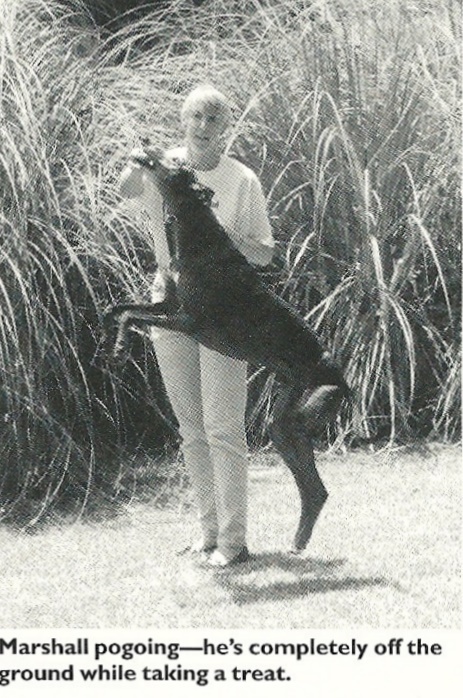 I know of one sighthound trainer who asks her dog to “gimme five” during training and between exercises. Anything that your dog is good at and enjoys doing is a good way to break up harder exercises. Now that Marshall’s trick is to pogo, he does so after each release from an exercise if he thinks he’s done a good job. The most important thing you can do in training is to make it fun and interesting for your dog. But if you want your dog to be interested in you, you need to be the most interesting thing around. Entertain your dog! Do unexpected things, like skipping while you heel, running away from your dog when you give him a recall command, or suddenly breaking off work to play a game of chase. One way you can gauge whether or not your dog is interested in what the two of you are doing is to watch his ears. If your dog’s ears normally lie flat, you’ve probably already noticed that when he’s interested in something they come up to half-mast, and when he’s really interested they come all the way up. Try to do things in your training that bring his ears up and his attention to you. Some trainers even train an “ears” command to encourage their dogs to look at them alertly during an exercise. When your dog is convinced that you are the most interesting thing around, he’ll be a lot more interested in playing your games (be they obedience, agility, or whatever). That will happen when he knows that your treats are better than the neighbor’s, your toys are more fun to play with than other people’s, and you are a lot more fun to be around than anyone else. Buy a cheap cut of steak (round steak works well) at the grocery store. Broil for approximately 4 minutes per side (more if thicker), until just pink on the inside. Allow to cool, then slice into 1/4″ thick strips or 1/4″ cubes. Place treats on a cookie sheet so that none touch, and freeze for several hours until hard. When treats are frozen solid you can transfer them to a freezer bag. You will be able to pull out just the number of treats you want for each training session. Be sure to allow treats to defrost before using them. This recipe also works for chicken breast and turkey breast if you increase the cooking time. Slice a hot dog into penny-sized pieces. For smaller treats, each penny can be cut into halves or quarters. Place on a cookie sheet and bake at 275°F for 30 minutes, until treats are cooked but not crisp. Blot excess grease from treats, then store in the refrigerator. These seem easier on the stomach than raw hot dog. Treats will keep for up to a week if stored in the refrigerator. Combine 1 heaping teaspoon honey with 1 heaping teaspoon peanut butter. When the honey-peanut butter mixture is smooth, add 3/4 cup flour, 1/4 cup oatmeal, 1 egg, 1/4 cup shortening or lard, 1 tsp. baking soda, and 1/4 tsp. salt and mix to combine. Drop in scant teaspoonfuls onto a cookie sheet and bake at 325°F for 8 – 10 minutes.